Here’s one from the archives. And by archives, I mean that I found it in an old photo folder, not that I’m re-posting stuff from a couple of years back. I may be nearly 2200 posts down but I’ve still got plenty to show you thankyouverymuch! I’m not a massive fan of Ciate… I don’t generally get excited about their releases if I’m honest. The bows (once you get past the cute factor) are a complete pain in the arse to re-tie and the bottle is a really awkward shape to hold for photos (SO not a valid excuse). 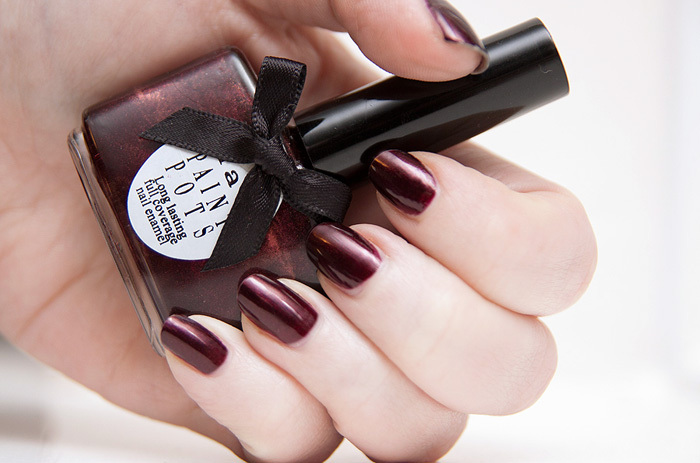 Ciate Silhouette is pretty though, it has a delicate shimmer running through the burgundy base and a nice amount of depth that gives a lovely velvety, plush look to the nails. It’s unremarkable in drying time and wear, I have no complaints at all. Definitely one of my preferred Ciate shades, you should also check out Starlet and Velvet Tuxedo if you want some other lovely Ciate polishes. I’ll check that one out, cheers Kelly! I only own one Ciate (which was free quite some time ago) and after their recent behavior towards beauty bloggers I doubt I’ll be buying again. Ahhh, t’was a shame and the NP companies have a tendancy to overreact don’t they? OPI are buggers too. Gosh, that is a beauty. Quite autumnal but I like it, A LOT. I rather like Ciate’s polishes. This shade isn’t really ‘me’ but I love Couture and 3am Girl. Starlet looks lovely too.